8/13 - Just found out that Significance is in pre-production to become a movie. With all of the amazing books out there featuring unique and intricate stories, I'm a little confused about why this story was picked to be brought to the big screen. There isn't much to the plot of the first book, since the world details aren't as fleshed out in book 1. How can you base an entire movie around two people who can't bear to be apart and have to be touching constantly? Am I the only one who is thinking this?2/12 (original review) - I have nothing personal against Significance. In this case, it's more about the right book at the wrong time (in my life). When I was younger and still learning about love, I know I would have enjoyed Significance. Back before I realized that love means having equal but separate identities, I might have swooned a bit over a story in which a young man and woman find each other and can't stand to be apart. At the age I'm at now, I know that even in the best of relationships, there are times when you want need your space. It would drive me crazy to have to constantly touch someone, or else feel pain. Even when I was in the stages of a relationship where I couldn't get enough of a person, I wouldn't have been happy with having my choice of whether or not to spend time with someone taken away from me.This book just wasn't my thing. Love is great, but this felt more like suffocation. So much of the book revolved around the connection between Caleb and Maggie, to the point where it got repetitive with some of the scenes. Maybe if the background plot had been pushed a bit more to the forefront, I wouldn't have been quite as antsy about how much these two kids were obsessed with each other. 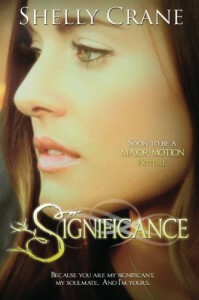 If you like books with extremely intense romances, you'll probably adore Significance. Many people have given this one a high rating, so I'm guessing that I will continue to be in the minority here. All-consuming love has a huge draw for many people and I understand why. It's a fun fantasy. If you like to get caught up in that fantasy, then this story might be a great fit for you. If you honestly like romances where people can't get enough of each other, or if you get pissed off at books when it takes an entire story for a couple to acknowledge their feelings, then I'd say to check this out. It's probably going to be right up your alley.As for the soulmates concept - I honestly don't mind books like these, as long as there is more to the couple than just what they are together. I do think it's possible to have a charming story in which two people are meant for each other and love to be there for one another, but still acknowledge that there is more to their life than just what's in their little bubble.My favorite example of soulmates fiction done right would be the Tairen Soul series, starting with [b:Lord of the Fading Lands|1584974|Lord of the Fading Lands (Tairen Soul, #1)|C.L. Wilson|http://d202m5krfqbpi5.cloudfront.net/books/1349068691s/1584974.jpg|1577873] because the epic story and world is just as engaging as the beautiful romance.As for book two in the Signficance series, surprisingly enough, I will probably end up reading it anyway. I found myself connecting to Bish and Jen, and am wanting to see how things turn out for them. Maybe I'll have better luck rating and reviewing the second book, knowing what to expect.